Interview: Shurat Hadin's Nitsana Darshan-Leitner explains why Sokolow vs. PLO could see terror orgs sued regularly for their crimes. 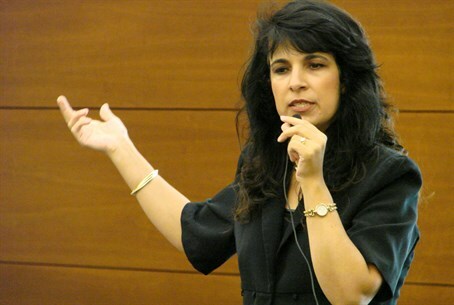 Legal rights group Shurat Hadin (Israel Law Center) is helping represent 11 families who charge the PA and PLO of inciting, supporting, planning and executing seven terror attacks which killed American citizens between 2000 and 2004. The trial, Sokolow vs. PLO, was recently cleared to be held on January 12, 2015 after the rejection of a petition against it by the two organizations - marking the first time the PLO will be held legally responsible for its actions. The verdict could be precedent-setting, Shurat Hadin's Nitsana Darshan-Leitner stated in a special interview with Arutz Sheva Monday night. "The Palestinian Authority is trying to create this image of being an entity worthy of becoming a state, and a judgement declaring that the Palestinian Authority sponsors terrorism or is involved in terrorism would make harder their efforts to become a state," Darshan-Leitner explained. "It would have to work very hard to clear up its name." "During the trial, there will be evidence showing that the Palestinian Authority, to this day, supports terrorism, pays money to terrorists, and the conclusion will be inevitable that they don't deserve to be a state." Darshan-Leitner added that the financial ramifications of a "billion-dollar judgement" against the PA would create "financial instability," as the PA is already struggling to dig itself out of at least $4.8 billion in debt. "Nevertheless, they will have to pay their debt," she noted. "If they want to become a state, they have to show that they can meet their obligations." Darshan-Leitner confirmed that a verdict against the PLO could set a legal precedent for lawsuits against other terror organizations. "If a judgement finds the PLO responsible for the terror attacks during the Intifada, that will set a precedent for other terror organizations to be charged with responsibility for the terror attacks they perpetrated," she stated. "The Palestinian Authority will have an overall responsibility for the crimes they committed during the Intifada - [and] every terrorist organization will [also] be liable for the attacks they committed." When asked what possible defense could be offered against such a charge, Darshan-Leitner predicted that the PA will attempt to spin the Second Intifada as a series of "lone wolf" attacks outside their realm of control. "The PLO's defense would be that it could not control the attacks, the perpetrators of the different attacks, that they were sporadic events which the PLO had no control over [and] did not encourage in any way, and basically that even attacks carried out by Palestinian policemen or Palestinian security officials were wrong and not authorized by the Palestinian Authority," she explained. "It's a very weak defense, because we have thousands of [pieces of] evidence - documents - that prove otherwise, prove that the Palestinian Authority not only controlled the attacks, but wanted to initiate the attacks and set up a policy to carry out attacks, wanted to direct their officials [and] their commanders to perpetrate attacks against Israelis, and incited to carry out attacks." "I think the Palestinian Authority's argument will not hold," she concluded.